Hebrew author of the seventeenth century. In the disastrous years of 1648-49 he lived at Sczebrszyn, Russian Poland, an honored member of the community, whence he escaped, on its invasion by the Cossacks, to Cracow; there he published his "Ẓoḳ ha'Ittim" (1650), an account, in Hebrew verse, of Jewish persecution during the Cossack uprising. This book was afterward published by Joshua b. David of Lemberg under his own name; Steinschneider was the first to discover this plagiarism. 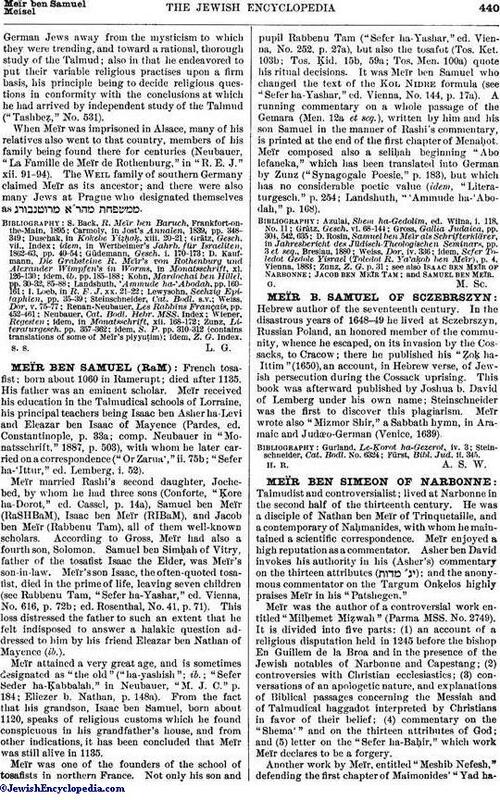 Meïr wrote also "Mizmor Shir," a Sabbath hymn, in Aramaic and Judæo-German (Venice, 1639). Fürst, Bibl. Jud. ii. 345.